A quarter of NHS wards routinely operate at unsafe staffing levels that threaten the safety of patients, according to a new study. Campaign group Support Stafford Hospital are calling on local medical teams to make decisions reflecting the needs of the local community. They stress that today's announcements are recommendations. The community must be integral to decision making. We hope that the Secretary of State will remember the 50,000 people who took to the streets of Stafford in April, the 55,000 who signed the petition for the retention of Acute Services and the thousands who marched in September for Children's Services. We hope that he will acknowledge that Stafford Hospital is now in the top 15 of the best performing hospitals in this country. The final recommendations of experts brought in to examine services at Mid Staffs NHS Foundation Trust have delivered their final report on its future. They include some changes to their initial draft. A maternity unit will be set up at Stafford, while there will be an upgraded child assessment unit staffed by specially trained clinicians. Seriously ill youngsters will still go to specialist centres. Cannock Chase Hospital will be used by recovering patients transferred from specialist hospitals. Money will be spent on upgrading services at separate hospitals in Stoke, Wolverhampton and Walsall. Stafford would be run by the University Hospital of North Staffordshire, and Cannock taken on by the Royal Wolverhampton. Health watchdog Monitor and the Health Secretary now need to approve the plans and any changes would happen over three years. Special Administrators at Mid Staffs NHS Foundation Trust have today announced £130 million of capital expenditure, £40 million of which will be spent directly on upgrading Stafford and Cannock Chase hospitals. Special Administrators at Mid Staffs NHS Foundation Trust are giving their final report into its future today. A midwife-led unit should be established. They say this will handle low-risk pregnancies - 50% of all births. A paediatric assessment unit should be run alongside the A and E, staffed by trained paediatric nurses and doctors. They say their plans will allow critical patients to remain at Stafford as long as their conditions are "uncomplicated". This will be assessed on a case by case basis. 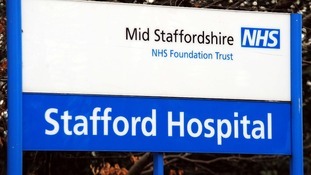 Special Administrators at Mid Staffs NHS Foundation Trust say they still believe it should be dissolved. They recommend that Stafford Hospital should be run by the University Hospital of North Staffordshire, or Staffordshire and Stoke-on-Trent Primary Care Trust and Cannock Chase should be run by Royal Wolverhampton NHS Trust. Plans for the future of crisis-hit Stafford Hospital will be outlined later today. Special administrators appointed by the government to look into the running of Mid Staffordshire NHS Trust will publish their final recommendations. In April an interim report recommended the trust which runs Stafford Hospital and Cannock Hospital should be dissolved. The law is clear: we can only prosecute a doctor if there is sufficient evidence of that individual's wrongdoing.